Yesterday Glenn Kellogg Founder and President of Hart Local Grocers (Rochester’s only downtown grocery store) announced much to the surprise and dismay of the community that it will be closing its doors on March 24th after nearly five years in business. As someone who has worked with Harts from the beginning when it opened in 2014 and having intimate knowledge of internal processes, staff and vendors this news albeit sad came as no surprise. My visits in recent weeks gave me a chilling feeling that the spirit and energy that once was had died. I can recall quite literally saying to friends and family recently that I felt that a closing was imminent. In the end, so many factors have contributed to this sad news for our City and Downtown development but more importantly so many questions remain. What will happen to the staff members (many of which live paycheck to paycheck) that are now without a job? Will Glenn Kellogg whose company owns the building find a tenant to replace the grocery store? Will staff receive a severance package? Will staff be able to collect unemployment? Will the local vendors that have become the heart and soul of Harts be paid in full? Harts was built with state and city grants, loans, and incentives; will they repay these debts in the closing? Harts when it was announced in January 2014 was the beacon of the growing Inner Loop fill in project. Hart’s was launched by Glenn Kellogg, an urban economic planner from Washington, D.C., who came to Rochester in 2011 with his wife. Kellogg modeled the grocery after a neighborhood market from the 1940s in the city called Hart’s, which was owned by businessman and philanthropist Alfred Hart. The store was set in the heart of the East End, directly on the bus line, close to The Little Theatre, 2Vine (now closed), RoCo, and a growing roster of residential development. It truly seemed like a win/win for Downtown as well as the community at large. Initially, management positioned Harts as a competitor to Wegmans but then quickly realized the error in this comparison and pivoted to make Harts a niche independent grocer that prioritized quality over low prices and sourcing from local small vendors, farmers, and merchants. This made sense for the stores size and very quickly Harts developed a community of local customers and vendors that made up for the prices that were in many cases double or triple what you would find in Wegmans, Tops or Aldi. Harts became known for offering seasonal vendor pop up markets that highlighted local products as well as standalone and collaborative classes with Rochester Brainery. Another highlight of the store was the Harts cafe. The cafe offered a rotating menu of seasonal made to order sandwiches, smoothies, and coffee. Harts was frequently listed as offering one of Rochester’s best breakfast sandwiches. The cafe always had vegan and gluten free selections which made it a highlight from the beginning. From the outset Harts garnered a reputation for being too expensive. As an independent grocer that worked with other local vendors it was no shock to me as someone learned in the retail world that their prices would not rival the prices of their regional grocery peers. Still one complaint that I recall hearing time and time again was that Harts was not priced for the every day Downtown resident. They eventually added the lesser priced Shurfine brand but by this time the reputation had been solidified. Even though Harts accepted EBT benefits this was not an aspect that they marketed or promoted heavily and many found Harts to be a store that quite frankly catered to those with more money and was curated less for community members who lived in poverty. Harts grocery delivery service went through many incarnations and by the time it took off for the store, Instacart and other options were on the market. In my opinion, Harts did not do a good job of marketing its delivery service or making it stand out from the crowd. All of this paled in comparison to the steady employee and management turnover which was an internal hurdle for the store from its inception. The most recent example of this was the unionization effort of employees that came from a result of years of the management putting the needs of its employees last and not first. With Harts closure we now have no grocery store in Downtown Rochester. This is a problem for our regions growing residential and commercial downtown district. Perhaps the community placed too much weight on Harts but perhaps Harts didn’t promote itself good enough for the every day consumer. What we know from Harts trajectory is that any grocer that comes to Downtown must meet the needs of all community residents and not just a privileged few. We know that Rochester has the highest concentration of poverty of any city of it’s size in the nation and this means that people need to be able to afford to feed their families. Harts overall did not meet this need very well. A niche specialty grocery store is not what Downtown Rochester needed and for all intents and purposes this is what Harts Local Grocers was. How did the City and County support Harts and its mission? We know that Harts was built with City and County subsidies, grants, and loans so it would be great to know how much the City supported the store’s success. Could this closure have been prevented? What about a worker co-op model? Many people compared Harts to Abundance Co-Op which now lives in the South Wedge. Could a worker owned model be a possibility? Is there still time to consider these questions? Or has the decision been made? 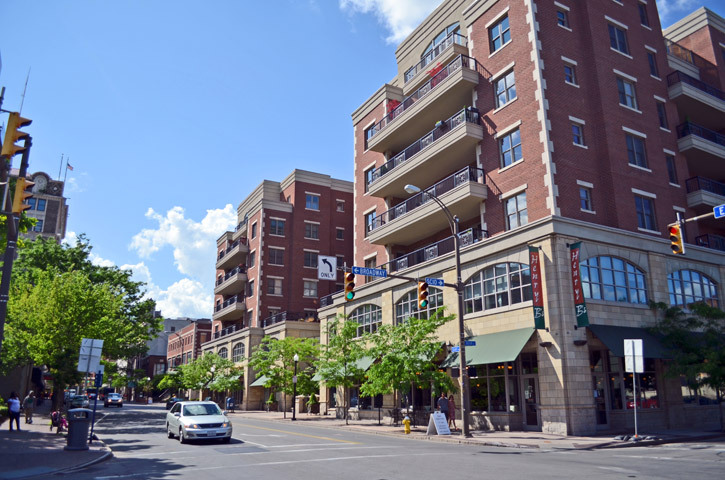 How will the City of Rochester support another Downtown grocer? Based on what we keep being told about current development from Heidi Zimmer- Meyer, Bob Duffy, and the Mayor’s Office a Downtown grocery store should be successful. What do we need to do to make one successful? It seems that Harts could have been more forthcoming about its issues many months before announcing this closure and had there been more transparency perhaps the community could have been included in helping management find a solution. Unfortunately like most major development in our City, the community is the last to be included and by the time we do hear or learn about anything; the decisions have already been made. It’s too bad since Harts made community so much a part of its model that it lacked the humility and transparency to include the same community that helped it last almost five years. Another big development built with taxpayer dollars bites the dust. We are pleased to announce Rochester People’s Climate Coalition as a Supporter level sponsor for the Spring 2019 Gentrification Conference. We are pleased to announce Community Preservation Corporation as a Supporter level sponsor for the Spring 2019 Gentrification Conference. CPC believes that housing is central to transforming underserved neighborhoods into thriving and vibrant communities. They provide innovative capital solutions, fresh thinking, and a collaborative approach to the often complex challenges that owners and developers of multifamily housing face. We are pleased to announce RocGrowth as a Supporter level sponsor for the Spring 2019 Gentrification Conference. RocGrowth seeks to increase collaboration among all local entrepreneurial support organizations, and make it easier for local startups to find the right resources to help them grow their companies. We are pleased to formally announce the Spring 2010 540WMain Gentrification Conference. The Spring 2019 conference will continue the discussion around the history of gentrification in Rochester neighborhoods. Themed “Development Without Displacement: Activism & Action the Spring 2019 conference will bring together leaders, developers, and residents of our community to learn about what is currently being done to counter displacement, find better solutions, and determine a collective path forward. ‘Fall 2018 Gentrification Conference // Who Are the Gentrified? What if crack had never been allowed to infiltrate black neighborhoods? What if our schools were among the best in the nation? What if redlining was never a governmental practice? I can’t help but wonder what our community could be if the issues we face today were considered unfathomable. Sometimes looking at an issue from a totally new frame of reference can help when we feel like we’re constantly putting out fires. I didn’t realize how important Black Panther’s mainstreaming of afrofuturism was until I came back home from college as a permanent resident in my childhood neighborhood, in Rochester’s so-called “crescent of poverty”. I did what they tell every high schooler to do: go to school, get an education, and come back to work in your community. But when I did, I was struck with a sense of guilt that I hadn’t felt before. I confided in someone who asked me if I had ever heard of internalized oppression. I scoffed, of course I have. Black Panther is a game-changer not only because it is a fantastic movie, but also because it imagines a world in which there were never limits placed on Wakandans. As much as I appreciate practicality (how can we think about unrealistic visions of the future when people’s’ livelihoods are at stake? ), I still think there’s immense power in creating a vision that actively resists what we’re told our community can aspire to. I’m looking forward to imaging what development without displacement could actually look like. Feel like. Taste like. I hope that the conference can lead to some great thoughts for how we can not only keep Rochester livable for the people who have been here for years, but also pour into what’s already great about it instead of only catering to the desires of those with the money we’d like to attract to fund the city’s revival. As a matter of fact, maybe it’s important that I stop using the word revival. Just because some are now seeing the city with a new set of eyes doesn’t mean it ever went anywhere. Marlana Zink is a community resident and graduate of Cornell University (17). She currently works as an urban planner in the City Rochester. Saturday’s Conference themed “Who are the Gentrified” is anchored on the real life testomonies of three Rochester community members negatively impaced by gentrification and City devlopment. They will share their stories, how gentrification has impacted them, and provide insight on how they see future development efforts that do not displace our cities most vulnerable. Below is a brief synopsis of each. Register for the Fall conference to see and hear them LIVE. In 2001, Liz McGriff bought 618 Cedarwood Terrace for $53,000. Her mortgage was sold and resold, as was common during an era when banks were purchasing distressed mortgages as investments, hoping to turn a profit when they foreclosed on the properties and sold them, or collected insurance for them. Liz McGriff, then fell behind on mortgage payments after losing her job in 2008, tried to catch up on payments and renegotiate the terms, but got nowhere. With a new job she had a willingness and ability to pay, but the bank foreclosed on her home. To buy it outright, she needed to pay more than $100,000 in cash. Then on a summer day in 2017 Liz received an eviction notice. Liz along with many community supporters took a stand against Midfirst Bank’s unlawful eviction and launched a fight against it and a financial system that condones predatory lending practices and unlawfully evicts homeowners that fall on hard times. From Somalia to Kenya to the refugee camp to the United States Mohamed and his family move to Rochester from Somalia when he was 13 years old where they started their life from zero. The family initially settled in the Plex Neighborhood and eventually found their way to the then known Gateway Park apartments in 1997. This neighborhood and complex became known for housing Rochester’s growing refugee community and over time the residents created a culture and community of their own; supporting and looking out for one another. Within a few short years the developers and their representatives or legalised gangsters” as Mohamed calls them began their campaign and promises of moving the residents to a better neighborhood and a better life in paradise. Then in 2006 the aggressive relocation plans began. Residents were promised free section 8 for life, cash settlements, and other incentives to sign their apartments away one by one. They had little say, were given little reason why relocation was needed, and wondered why they couldn’t have their apartments renovated and then move back into neighborhood they had all called home. Born and raised in Bronx, NY Jody Francis has lived in many places around the country throughout his adult life. Life and circumstances brought him to Rochester in 2013 Jody eventually found a rental in the Meigs neighborhood where he has resided as a no problem rent paying tenant until he found an eviction notice on his door this past August. Management had sold the building to a 34 year old local developer that wanted all tenants; some who had been in the building for 19 + years gone in 30 days. Says Jody ” when it rains it pours but poor people like us have to advocate for ourselves.” A phone call to Mary Lupien (who he had met during his time on Parsells) led to a meeting with Ryan Acuff, President of the Rochester Tenant Union.